Finally got the old supercharged Mustang put back together and sold. I'm now down to just the daily driver -- a 2007 Solstice GXP with 60k miles. The Trifecta tune was fun but it needs a little more now. 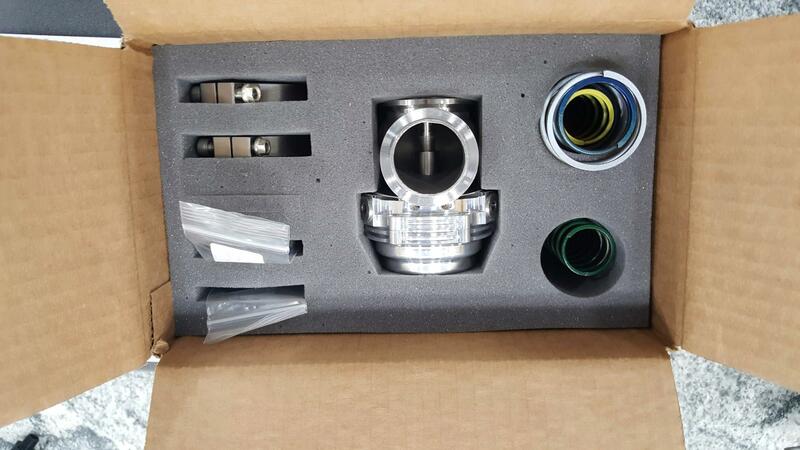 I ordered the EFR6758 WR3 setup from Werks. I didn't even realize when I ordered it that it now has an external wastegate. Since it is a daily driver I really need to complete this in one weekend. For those that have done this can you tell if I'm missing anything and what other parts I will need to do this in one shot? 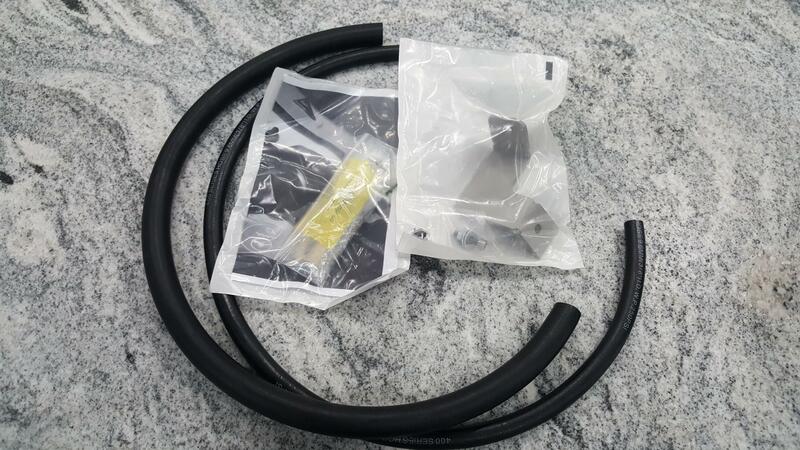 I ordered a bunch of crush washers for the banjo fittings and a new seal for the oil drain line but that's it so far. Intercooler installed. Took a little more fitting than I was expecting. The diverter shroud that sits behind the intercooler had to be trimmed in a couple of places to get everything to fit. The larger intercooler sits quite a bit lower. I was already scraping the front end on the driveway before. This going to be even more tricky getting in and out. Last edited by znaut; 01-23-2019 at 02:03 PM. 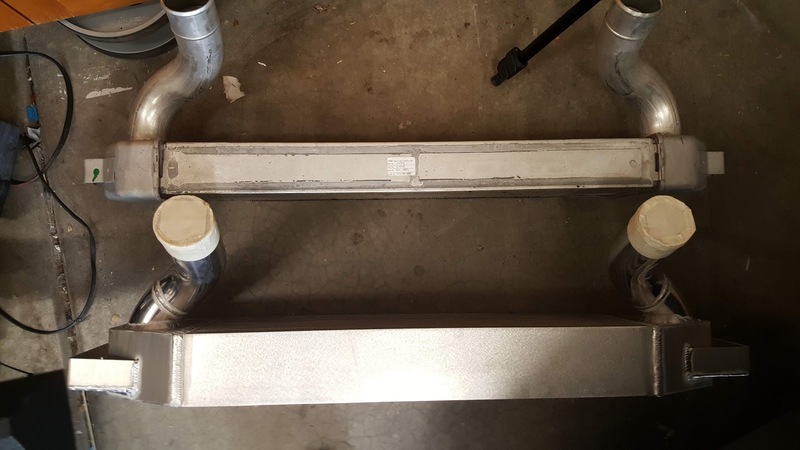 What's that extra pipe on the high flow catalytic convertor used for? I was already scraping the front end on the driveway before. This going to be even more tricky getting in and out. We had four vehicles scraping on our cursed roll-up curb. After my daughter ripped the front facia off the Beetle for the third time I caved and ordered these. No more scraping. It's for the external wastegate. 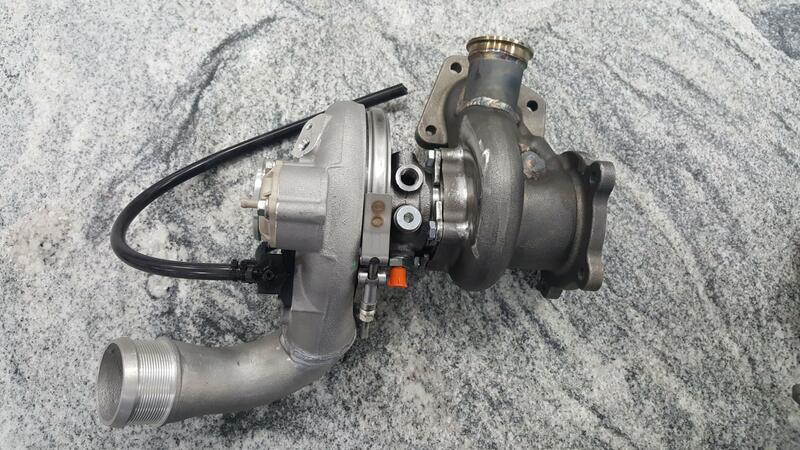 The wastegate plugs into the bottom of the turbo, and its output connects back to the cat. Last edited by raygun; 01-24-2019 at 12:49 PM. This is the first time I've heard of something like this, please post pics once this is completed. I'm very curious to see what this looks like. I think I was getting the term wastegate confused with a BOV. I don't have pics handy, though I'm sure I took one during the last engine swap on the '06. 1. Exhaust comes out of the engine, into the exhaust manifold and a tee to the wastegate and turbo (turbine / "hot side"). I use the word "tee" loosely, since the actual routing is in the turbo housing. 2. At low(ish) exhaust pressure (gas volume and velocity), the wastegate stays closed, so all of the exhaust gases go into the turbo, spin the turbine, which spins the impeller in the compressor housing, which creates boost. 3. 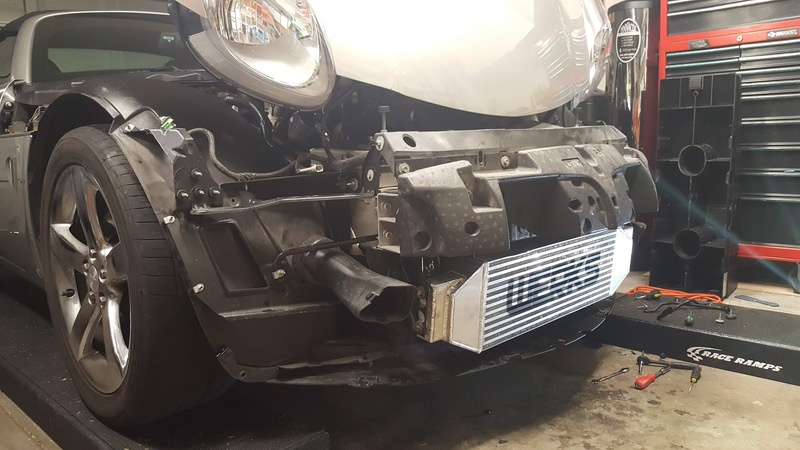 When exhaust pressure hits a certain point, the wastegate opens up a bit, allowing some of the exhaust to bypass the turbo. That gas can be vented to atmosphere or, in this case, shunted back into the exhaust after the turbo. That limits the turbine speed, which limits boost, which keeps your engine from exploding due to extreme pressure, predetonation, etc. 4. 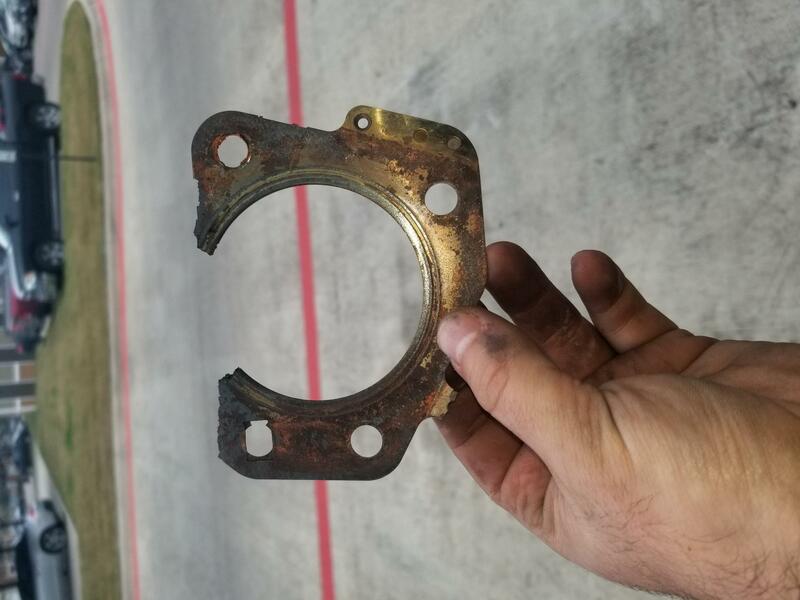 The wastegate can be a mechanical device - basically, a spring-loaded plate blocking a valve, which exits to the exhaust - or an electronically controlled valve. Mechanical wastegates are the norm. 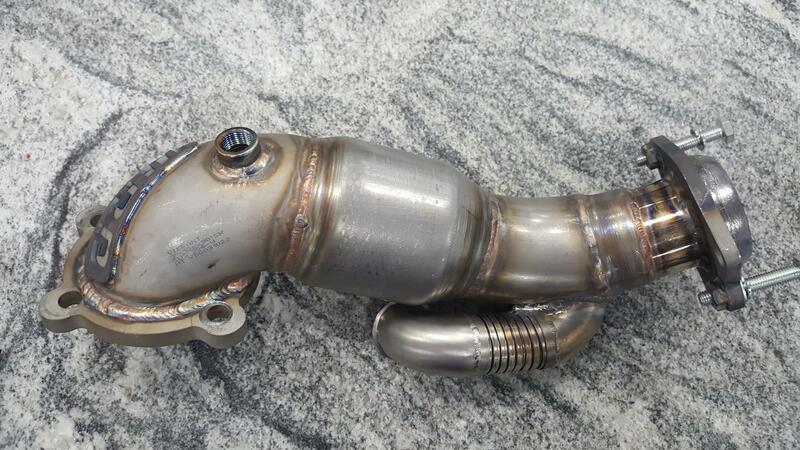 In the downpipe shown in the pictures, the "extra pipe" is the route by which the "extra" exhaust gases bypass the turbo. If it wasn't there, they'd have to either go through the turbo ("boom" at high RPM + throttle) or into the air. 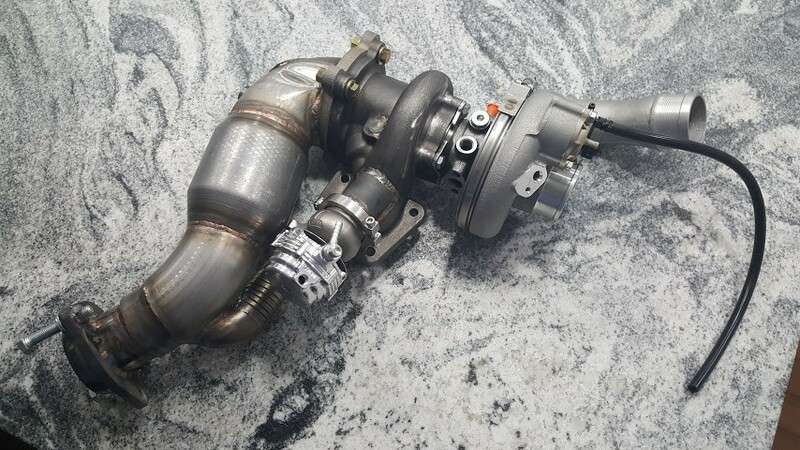 So, the wastegate basically bleeds off exhaust gases to limit turbine velocity, and the extra pipe lets you stuff that back into the exhaust so you don't get hypoxia and Mr. Emissions Inspector doesn't get annoyed. 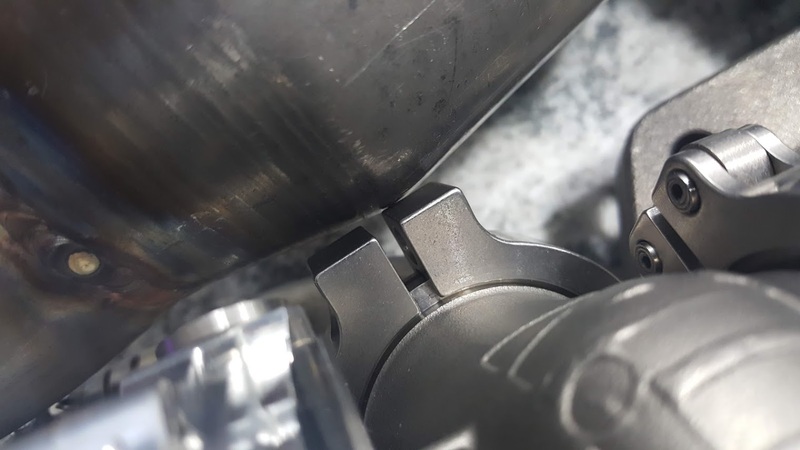 The blow off valve (or bypass solenoid on a stock GXP) does something related, but different. When you let off of the throttle under high boost, the butterfly plate in the throttle nearly closes. 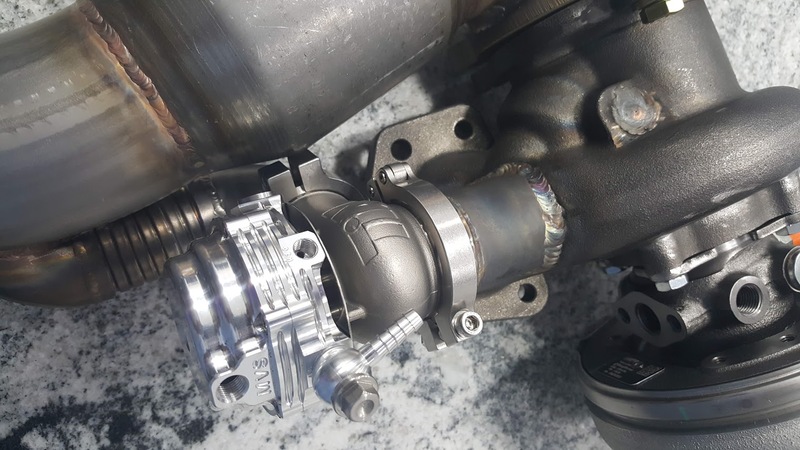 All of that high-pressure, very-compressed air in the intake tract (turbo compressor to intercooler to throttle body) will try and force its way past that valve, and also backwards into the turbo compressor. Then, the compressor blades are trying to spin one way, which I shall label "clockwise", but the force of the compressed air in the intake tract, which has nowhere to go due to the closed throttle and is, therefore, trying to push its way backwards into the turbo, are trying to spin it the opposite direction (which I shall label, quite without purpose, "counter-clockwise"). That will happily knock blades off of the compressor, lock the engine, or other Very Bad Things. If you're very lucky, you'll just destroy a hose coupler or your intercooler. 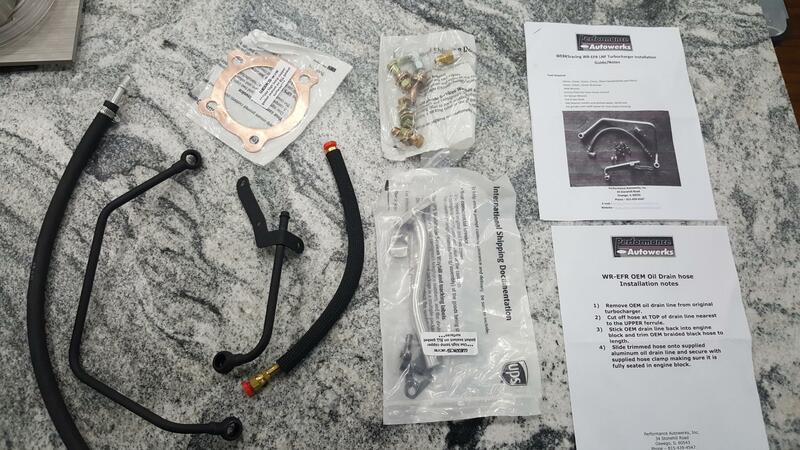 The blow off valve is a pressure release valve that lets the compressed air exit the system somewhere between the throttle body and the turbo, to avoid damage to either. It becomes the path of least resistance for the compressed air, so the turbo and throttle can keep doing their thing. A lot of people think that the BOV should be open at idle. They are wrong. Due to the Venturi effect, an open BOV will be a source of unmetered air if open under vacuum. 1. Wastegate - pressure relief valve on the exhaust side that keeps the turbo from spinning too fast (engine goes BOOM), lets some exhaust gas bypass the turbo when necessary. ChopTop and easyryderca like this. Last edited by raygun; 01-24-2019 at 04:50 PM. Interesting. I was wondering if something like that existed. I'm sure my HOA will pitch a fit lol. Here's everything mocked up with the wastegate. That second clamp on the WG is a tight fit. Took a bit of wrestling to get everything lined up. Not condescending at all. I work from the principle that it always better to ask than not, along with knowing that when someone answers a question it also helps others to understand. You have either never dealt with an HOA or you are being totally tongue-in-cheek. You could "accidentally" spill some concrete in the middle of the night. While you're at it, spill a road hump to stop the jerks that scream through the neighborhood at 50MPH. (Surely I'm not the only one that's experienced that?) Just make sure it's a nice, long bump that won't scrape your car, but would cause issues for a dropped Civic going way too fast. 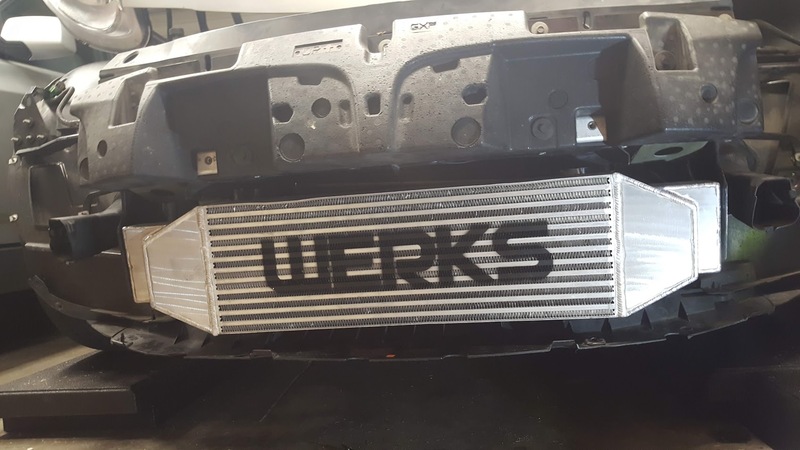 I recently upgraded my werks wr2 to the external wastegate after the actuator rod broke. And let me tell you, its hard to reach in and get it all together. Make sure you replace the gastet between the turbo and the manifold or this will happen. The power steering resivoir needs to be moved, for the bigger turbo and maybe even cut the bracket. My suggestion is also to ditch the studs holding on the turbo and use high quality bolts instead, easier to get the turbo on and off. Lastly, i had repeated issues with the coolant hard line cracking. And the oil drain line. I replaced both with straight fitting to vibrant high temp heater hose with an insulating sleve over it no more banjo bolts, and no more cracking lines. The oil drain on the turbo accepts a threaded fitting, and a 5/8ths (i think) hose adaptor exists for the lnf turbo oil drain.